At 10 p.m. on a June evening, the planets Saturn, Mars, and Venus are all in the evening sky. Over the next two months they will slowly close in on each other. Full Story. If you live in the northern hemisphere, go out any nightthis week an hour or so after sunset and look at the western sky to catch aplanetary triple play starring Venus, Saturn and Mars. The first thing skywatchers will see — weather permitting —is the brilliantplanet Venus, slightly north of west, in the constellation Gemini. Look forGemini's twin first magnitude stars, Pollux and Castor, just above Venus. As the sky gets darker, the planet Mars can be spotted toVenus' left as it appears in the constellation Leo very close to the bright,first magnitude star Regulus. Further still to the left will be Saturn shiningin the western part of the constellation Virgo. 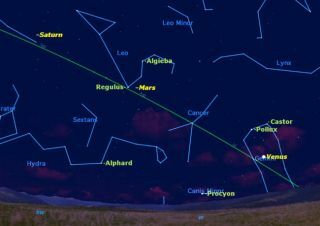 This sky map shows how to spot all three planets as they appear across a 71-degree angle inthe night sky. For comparison, your closed fist held at arm's length coversabout 5 degrees of arc in the sky. Note the positions of these three planets in relation tothe bright background stars, because they are beginning an interesting journeywhich you will be able to follow over the next two months. In early July, Venus will have moved rapidly to the left,crossing Cancer into Leo so that now it is next to the star Regulus. Mars,meanwhile, will have moved somewhat to the left. Saturn appears to have hardlymoved at all. By then, the three planets will now cover only 37 degreesin the sky, only half the spread they showed in early June. A month after this, in the first week of August, theplanets will be crowded into a 7-degree angle, and Mars will now be to the leftof Saturnin Virgo. Venus, too, will have moved into Virgo. All three will fit comfortably in the viewing field of asmall pair of binoculars. By August, Venus will still be brilliant, but both Saturnand Mars will have faded so that they just barely reach first magnitude. That'sbecause Saturn and Mars are getting farther away from Earth, while Venus isgetting closer. From the southern hemisphere, the planets will appear inthe same positions relative to each other, but the ecliptic will be almostvertical, and the planets arrayed one above the other, rather than forming anoblique angle with the horizon. This will be a fine opportunity to observe the relativemotion of three bright planets against a well marked background of stars,and to see the very different speeds at which they move: Venus traversing fourconstellations and Mars two, with Saturn hardly moving at all.